Create a 'basic' randomized 1-prim stone type of object. Add a tiny XYZ random noise to the 3D sculpt object. Add a lot XYZ random noise to the 3D sculpt object. Cut random holes into the 3D sculpt object. Add random spikes onto the 3D sculpt object. Cut spikes into the 3D sculpt object You can change the number by changing 8,16,32 buttons. Add spikes onto the 3D sculpt object You can change the number by changing 8,16,32 buttons. Flattens the top, it starts at the top, and everytime you click it goes down 1 step. Flattens the bottom, it starts at the bottom, and everytime you click it goes up 1 step. Scales or Bend the sculpt in X, Y or Z. Smooth's the current sculpt, this is the button really: for making the sculpt look ok again. Smooth's the current sculpt towards a torus shape form, this means the top of the sculpt will smooth down towards the bottom of the sculpt. Smooth's a plane kind of sculpty. 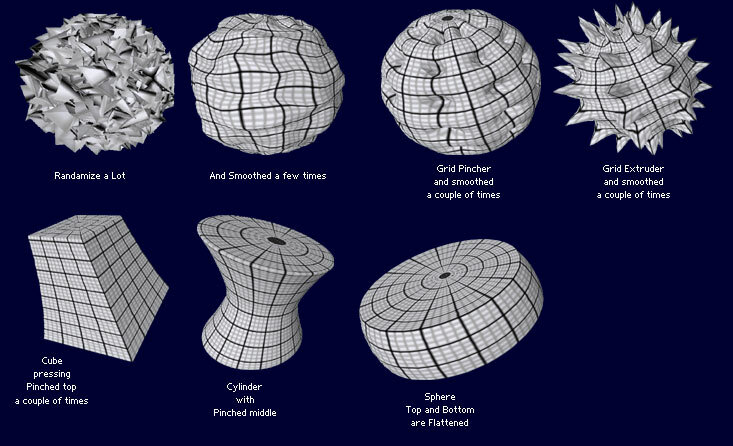 Resets the sculpt-shape back to a basic Pyramid, Cylinder, Cube, Sphere, Torus or Plane (and resets the texture). 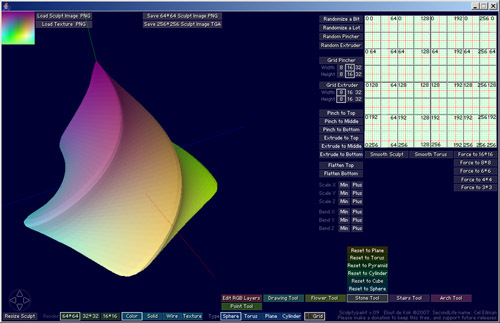 Reset to plane: to square, triangle or roundish..
tip: If you reset it to plane, and then go to the RGB Layers, load a greyscale image in the green layer, you will get a height hieroglyph. tip #2: If you look at the model with the grid-texture on. And it show the numbers of the texture correct, this side will show up correct in Second Life. If the numbers are being mirrored this means Second Life won't show this side. And it can tell; if (parts of) your 3D model is insideout. Forces the 3D model points to merge at the same place with other points. When uploading these models lossless in Second Life, it will result in sculpties with sharp edges. Forces the model almost like Second Life does. Use the hard version for like cubes. Check my fun tutorial Cel Edman's Bad hairday in my attempt useing the Stone Tool for creating 1-prim sculpted Hair.